Improve your writing skills – now! Develop the quality and effectiveness of your writing. Learn how to get rid of mistakes. Make every word count. No grammatical rules involved. Give clarity and shape to what you say. Packed with good advice, handy hints, and everyday examples. It features clear non-technical language, and quick solutions to common problems. Suitable for anybody writing reports, business proposals, memos, or academic documents. Amazingly good value! 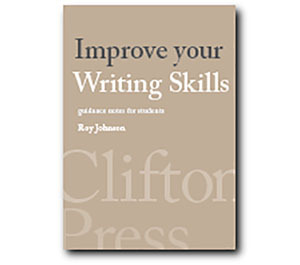 Introduction This book will help you to write more effectively. You will understand the techniques and develop the skills required for all types of efficient and persuasive writing. Audience Choose your style to suit the reader. Keep in mind the form of the writing and what it is supposed to achieve. Generating ideas Plan what you’re going to say before you start writing. How to come up with new ideas and make notes on topics you want to cover. Taking notes How to take notes whilst reading, watching videos, demonstrations, or in lectures. Write less, think more. Punctuation The basics of simple and effective punctuation. Where to use the comma, semicolon, colon, and full stop. Understanding the apostrophe. Grammar How to create clear writing without mastering the rules of grammar. Avoid the traps of bad syntax, poor case agreement, and incomplete sentences. Spelling How to improve your spelling. A few basic rules, then use dictionaries and spell-checkers, and re-read everything you write. Sentences How to create simple and effective sentences. Keep them short, and keep them simple. How to avoid common problems. Vocabulary Choose the right words for the task. How to recognise and avoid jargon, cliche, and abstractions. Paragraphs A paragraph deals with just one topic, which is announced in the opening sentence. The structure of a good paragraph. Good style Good style is writing which is appropriate for the writing task. There are different styles for different purposes. Some examples. Drafting How to use multiple drafts to produce an effective finished product. Re-write your work, eliminate mistakes, and move paragraphs around. Editing How to check the finer details of your writing to improve the quality of the final product. A checklist of what to look for. Presentation How to use the layout and graphic presentation of your work to maximise its visual impact. Use space to make your work look good. Strategies Write in a manner that suits you. Planned and unplanned writing; the use of outlines and drafts; cut and paste techniques; improvisation, and expansion of notes. Structure The importance of good organisation in writing. Introductions, arguments, and conclusions. Use headings, sub-headings, and bulleted lists to create visual structure. Essays How to plan, structure, and write an essay. An explanation of the stages in producing an essay. A sample essay plan. Computers Use the computer to draft and re-write your work. Save multiple versions, format your text, and use the spelling and grammar checker. Electronics Write emails that work; watch your language and Netiquette; frequently asked questions. Problems Overcoming fear of the blank page; avoiding repetition and over-long sentences; selecting the right tone; and removing blemishes. Bad writing What causes bad writing, and how to avoid it. The difference between writing and speaking. Writer’s block Seven effective techniques for getting words onto the page. Recognising your type of block. How to generate more text. 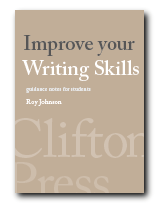 Reading Suggested further writing and style guides: book reviews with direct links to Amazon.